Once upon a time, when I was a fashion forward city girl, I wore every accessory imagineable. Bracelets, earrings, pins, necklaces, and rings, you name it, I wore it. Things changed though when I moved to the mountains. By adopting a more relaxed, albeit plain attire, I also began pairing down the "bling-bling". Piece by piece, my everday flair dwindled to just one essential. The only thing you find me wearing on a daily basis now is a necklace. Currently, I have a few different necklaces that I enjoy wearing. However, most of the time I will stick with the one in particular that is resonating with me the most. Although, I don't alternate too often. I have a well known habit of wearing things out when I really like them. For example, I wore one necklace, day in and day out, that my best friend gave to me as a gift. 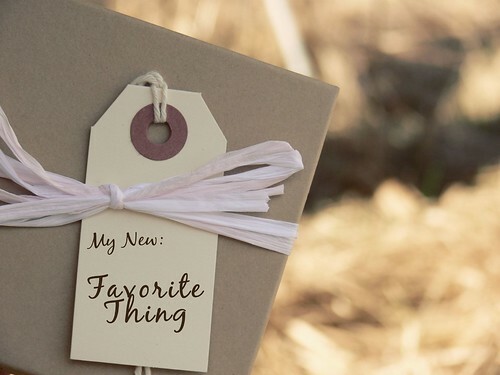 That thoughtful token means so many different things to me, and is one that will definitely remain in my top favorites. Always. But recently, as good fortune would have it, someone bestowed upon me a very special handmade piece that has quickly become my new favorite. Throughout Lisa's online shop you are sure to find many different treasures to add to your "I'm going to own that!" list. As a matter of fact, you will probably find a handful! I especially like her custom "mommy necklaces", they are the perfect keepsakes! Right now seems like an opportune time to cash in on Mother's Day--not that it's about the gifts ;). To sweeten the pot, she even passed along a coupon code to WW readers! So, if you are looking for a keepsake that is as wonderfully unique as you are, Lisa Leonard Designs is definitely the place to go. Use code welcome15 for 15% off! She has a brand new website that is super cute! Click on the button above & it will take you to her online store & lovely blog. I have a necklace that never comes off. Funny how we get stuck with something like that. I like your birdie! I'm so in love with all things birdie - so cute. I randomly found her blog around Christmas time...and since my nickname is Bird...I thought I should have that necklace! I love it! I emailed links to potential present givers, but no one gave it to me. How crazy is it that tonight I randomly found your blog with not only the necklace, but a coupon. I think I need to have it!!! that's a pretty cool necklace. That's the sweetest thing, that necklace with the pearl that sings. I love the design. It's wonderful that you are promoting Lisa's work and that she is offering a discount for WW fans. I will definitely check out her website. Just read the comment by Jaysi and I think that is astonishing serendipity! Wow you are so lucky to receive a beautiful gift like that. I check out your friend website and she has some lovely necklaces. I have marked her site as a favourite for future reference. I checked out her site. Very nice! I like the monogram necklace and the pearl drop earrings,... hmmmm.... should I order,... heck, the bills are paid for the month,.. why not? My daughters tend to keep their jewelry simple. This runs to their taste. I'm the same way with things I like. I only owned one pair of jeans until about two weeks ago. I wore them ragged... still do when appropriate. Looking forward to seeing more of her jewelry... Happy Weekend. 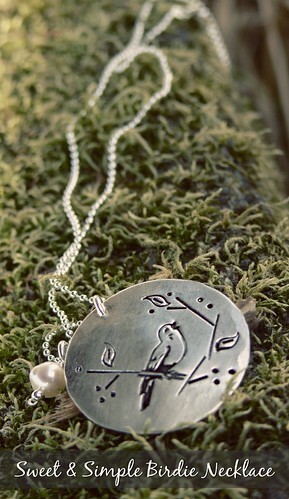 I've recently found a love for birds and that necklace is so cute! Thanks for sharing! i am indeed in ireland and loving it so far! I always wear a necklace. I have a few favourites that I wear the most, but I go with another one when the mood strikes. Almost all my necklaces are from craft shows -- unique, handmade jewelry appeals to me more than expensive metals and stones. Great necklace. Love birds !!! Especially their sweet song every morning these days. found you through shutter sisters. i love up close and personal in photos, too. wonderful blog and photography here. wow ~ the jewelry is so beautiful...i can always wish right!? Your little birdie is SO cute, and the designers site and "button" are adorable. Love the necklace. I have a couple of things I wear a lot because they are my favorites. Cute necklace! Love the birdie. I just saw the baby spoons on another site. I love her stuff. Have a great Saturday. Noticed it immediately when i saw you the last time in TN; and it looks nice, which makes a focal point of your nice shoulder and neck. Coupled with your smile, you're picture perfect. very cute--I wear just a necklace, too. I originally came here from One Single Impression to tell you what a lovely posting you made there for "One Word". And now I find this exquisite necklace of yours I so love unique jewellery far away from the traditional precious stones! I love Lisa Leonard! :) I swear this blogy world is a small one. Oh I love all things "bird"...thanks for the link, will totally check it out!